Fig. 102 I-S (investment-saving) schedule. 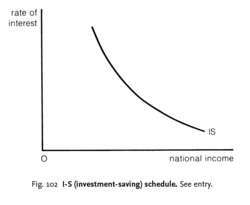 a schedule displaying the combinations of levels of NATIONAL INCOME and INTEREST RATE where the equilibrium condition for the real economy ( INVESTMENT=SAVINGS) holds (see EQUILIBRIUM LEVEL OF NATIONAL INCOME). As shown in Fig. 102, the I-S schedule is downward-sloping: a lower rate of interest stimulates a higher volume of investment (see MARGINAL EFFICIENCY OF CAPITAL/ INVESTMENT), which in turn generates a higher level of output and income through a MULTIPLIER process. However, a higher volume of investment requires a higher volume of saving to keep the real economy in equilibrium (S = I). A higher volume of saving will only be forthcoming at a higher level of income; therefore a lower rate of interest requires a higher equilibrium level of income. The I-S schedule interacts with the L-M SCHEDULE in determining a general equilibrium position for the economy as a whole.